Apart from the hundreds of designs and functionality to choose from to find that perfect dining furniture, you would need to also consider your lifestyle. Do you have small children at home? If so, then consideration for the material used should be on your top list. Do you like hosting? If so, how much space do you have to host? do you like hosting formal or casual parties? How often do you to host people? It is not an easy feat and that’s why we have for you the Top 10 Best Dining Table & Chair Sets in 2019 to choose from. These sets are timeless with their clean lines and sleek and simple designs. A factor to consider is size and the need for expandable table. 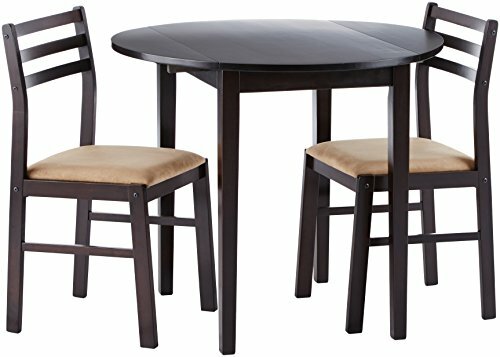 Top 10 Best Dining Table and Chair Sets in 2019 Reviews. 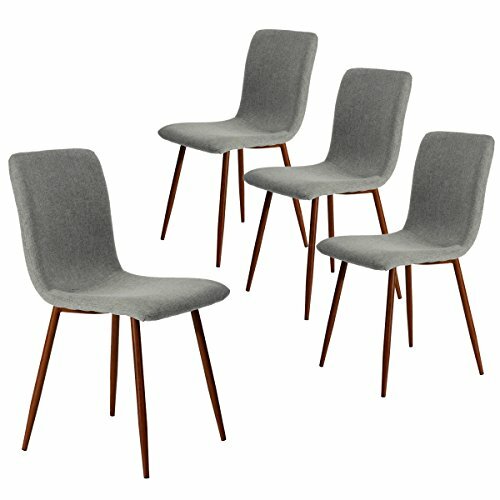 Already got a dining table but could not find the right chairs that can along with it? This dining chair set could be an option for you if you are looking for inexpensive yet “classic” clean-line design to match your dining table. They require self-assembly, seat & backrest are made of thinly padded linen-fabric while the legs are metal painted in oak-wood to soften the design. Each chair is 17.7” in length, 16.5” in width, and 34.8” in height. It can also be used in any other spaces of your home – living room, study, or vanity. Although, due to its design, they are non-stackable. So, make sure you got enough space to place the chair, should your dining table be an expandable one. At just over $40 a piece, it is a bargain set. This “dining” set can transform a simple or boring corner of your home into a serene or romantic space for breakfast, brunch, or tea-time. Should you require a bit more space for your dining spread, the table’s drop-leaf design comes in handy, around 13-inch additional table space when both leaves are up. The chairs come with a tan padded polyester for comfort and to add contrast to the dark cappuccino wood finish. Although you need to be wary that because this is a compact set, the back of the chair is quite low at 33 inches. So, you might need backseat support or padding. 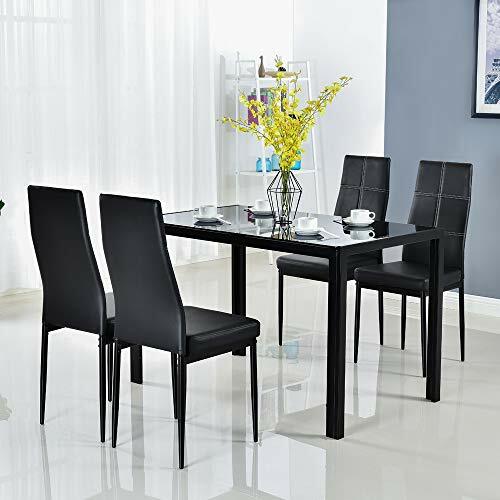 A casual dining set that comes with a black tempered-glass-top table and 4 PVC-leather chairs. Both table and chairs have iron/metal frames. The overall design is sleek with its clean lines and elegant black color theme. The glass top of the table adds a certain level of class. Although, it is not scratch proof, it is easy to clean not to mention that with a 47-inch table length it gives ample space for your dining spread and your individual person dining space on the table. It can be more challenging to assemble but is easy enough as assembly tools and instructions are included. Although, it is an ideal dining space for four people, you can easily squeeze in two more extra stools and provided that your spread are taken on a separate serving table/consul. 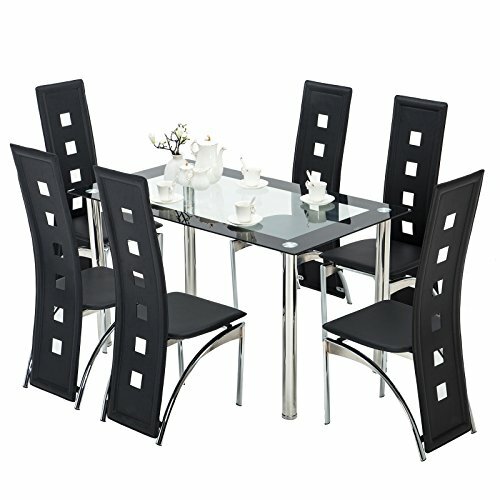 A dining set for 6 people whose chairs add some personality to an otherwise plain Jane clear-tempered-glass top table. Both chairs and tables have rust-resistant steel frame. The chairs have a PU leather backseat that is the “personality” of the entire set. The curved anchor between the chairs’ legs add a more elegant and modern feel to them. Despite the simplicity of the table, it adds an illusion of space. Thus, together with the chairs, the entire set looks more modern, classy, and airy. For those with small toddlers, you might need to replace the chairs with a proper high-chair for them to dine with you at the same table. For adult party hosting, one can never go wrong with this neutral toned set. This is set gives a rustic feel with its combination of wood and metal materials. This set comes with a wooden-top table with metal wire shelving just beneath the top, 4 chairs with wooden seat & backrest, and a wooden bench with a metal wire shelving underneath. All pieces have metal tube frames that gives its suburban design. It seats 6 people and the metal wire shelving on both the table and bench adds space for tableware. An ideal set for covered patio space to host semi-outdoor parties and events. Conversely, if your home has cabin-style dark interiors, it can be a suitable dining set as well. If you are more a bachelor living in small space and seeking romantic evenings at home, this may be a suitable pick for you. 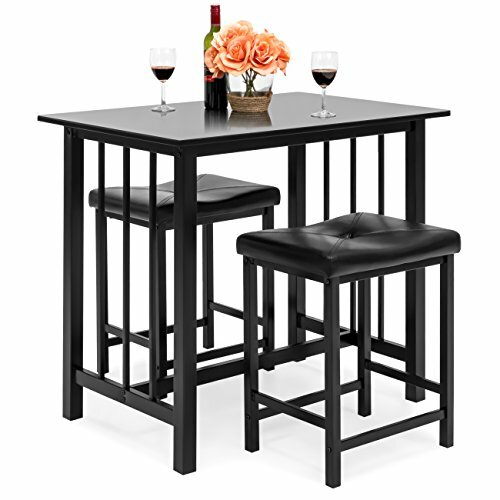 It is essentially an all-black finished bar table and chair set that adds a bit of pizazz to your space. The faux-marble table top and the PU leather seats add a certain level of sophistication to this set. Considering that the table is only 24-inches in width, you might only be able to host a wine and cheese or tapas night with your better half on this. Otherwise, it is enough for one person to have for usual dining. 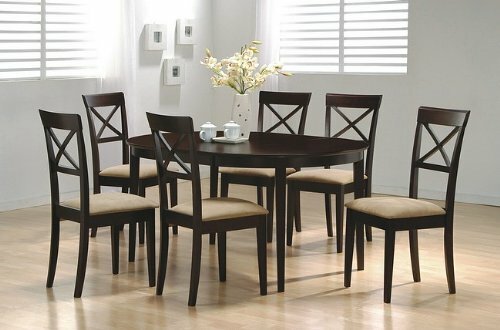 You will not go wrong with this classic and sophisticated dining set that seats 6 people. It blends well with almost every other home interior. It may not be a conversation piece, but it is practical and not to mention expandable. The oval-shaped table expands to 60 inches from 42 inches and so can add more diners, if needed. Chair seats are upholstered while the backrest is accentuated with a “criss-cross” design using the same material as the entire set – solid hardwood and veneers. Ideal for those with big families or for those who like hosting family dinners like Thanksgiving. 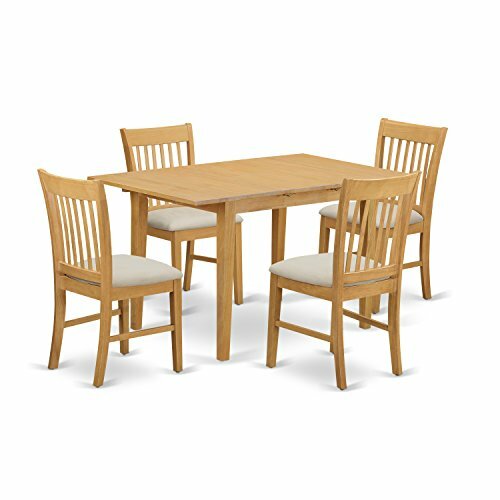 This oak-finished simple dinette set comes with one table and four chairs. The rectangular table comes with an expandable leaf to add more space for the diners. Chair seats are upholstered and padded. It is simple, classic, and practical. The key feature of this set is that it is made of 100% Asian hardwood. That means no medium-density fireboards (MDF), veneers, and laminate. Not sure about you, but for me, it sounds like a sturdy, high-quality, and a value-for-your-buck furniture set. Also, due to its simplistic and minimalistic design it suits well in Nordic-interior home. Ideal for small families. Having said this, you might need additional tables and chairs to host bigger crowds. 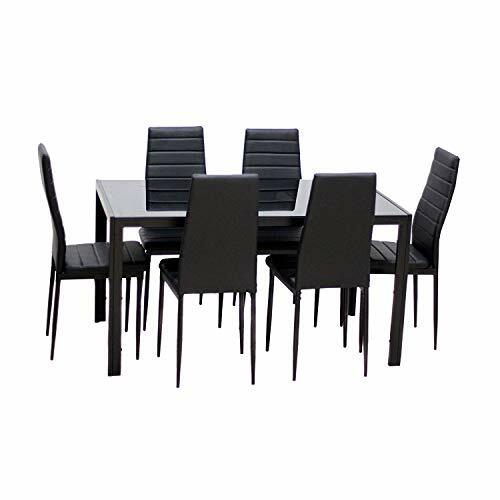 This set is basically an expanded version of the Bonnlo Modern 5 Pieces Dining Table Set. The only difference is that this one seats 6 more comfortable while the Bonnlo dining table set would be more cozy with 6. Like the Bonnlo dining table set, this is a modern but sophisticated set that suits well with contemporary home interiors. Suitable for your small diners as well since the seats are comfortably cushioned. 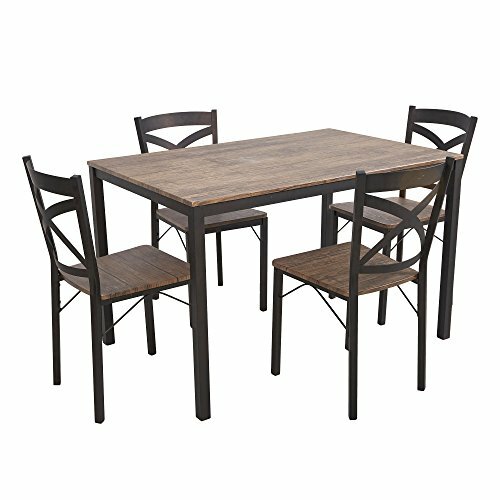 If you calculate price per piece the Bonnlo dining table set comes only slightly cheaper. Having said this, the only deciding factor between this set and the other one is whether you have more regular diners or not. 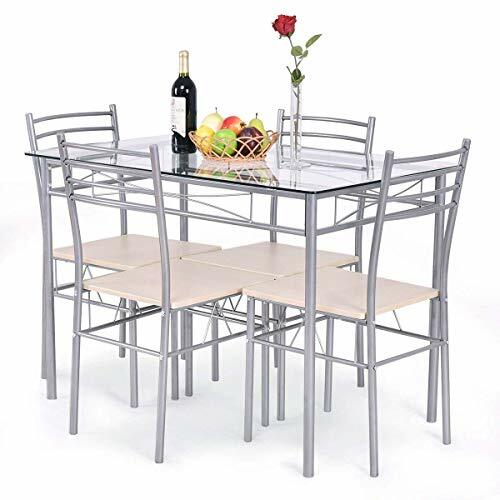 A contemporary dining set that is comparable to Mecor 7 Piece Kitchen Dining Set with its rectangular glass-top table and metal frames on both the table and chairs. The difference? Well, in my view, this one lacks personality or the “wow”-factor on its chair design unlike that ones with the Mecor dining set. However, I find this set to transcend time and period despite its classic and plain design. It is more elegant in my opinion with its simpler and more linear design on both the table and chairs. Also, this is bit smaller than the Mecor dining set, as this only seats 4 people and no space to squeeze for even one.